Sterling Children's Books, 9781454917519, 192pp. What happens when the girl who knows everything . . . suddenly doesn't? 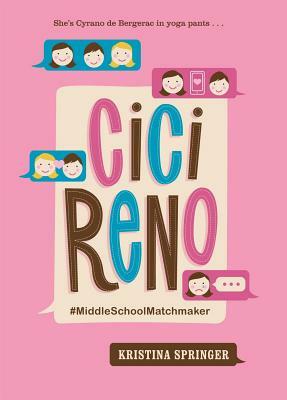 Middle school is a test, but Cici Reno has all the answers. She's the go-to girl for advice. She's cool, she's funny, and she's enlightened (thanks to yoga classes at her mom's studio). So when her pretty BFF, Aggie, is too shy to speak to the boy she's crushing on, Cici goes online and does the talking for her. The only problem is, Cici starts to fall for the guy herself For the first time in her life, she doesn't have a clue. Kristina Springer is the author of My Fake Boyfriend Is Better Than Yours (Macmillan/FSG), a Scholastic Bestseller and 2012 YALSA Quick Pick book; The Espressologist (Macmillan, FSG), a 2010 Society of School Librarians International Honor Book and 2014 Illinois Reads Book that has been purchased for film by Michael Eisner's Vuguru; and Just Your Average Princess (Macmillan/FSG). She has a Masters in Writing from DePaul University and resides in a suburb of Chicago with her husband and children. Learn more about Kristina on her website: KristinaSpringer.com.